Official CM14.1 custom ROM now available for the Oneplus 3 smartphone. The new CM14.1 is based on the latest version of Android 7.1 Nougat. 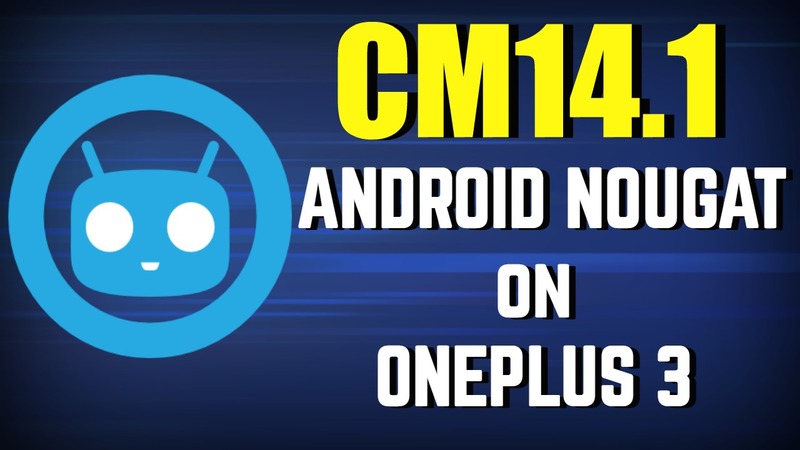 So after a long wait, the first official CyanogenMod 14.1 for Oneplus is available for download. It is an experimental build, but it’s quite stable for daily use. With this new build, OnePlus 3 became the first Android devices which get the latest CM14.1 ROM officially. There are so many CM14.1 unofficial builds are available on the net, but this one is from the official Cyanogen team. If you want to run this Official CM14.1 Android 7.1 Nougat on your Oneplus 3 phone, then all you need a phone with TWRP recovery. Check out our guide here how to install TWRP on Oneplus 3 phone. Download and Install Official CM14.1 Nougat ROM for OnePlus 3 from below mention link. The new CM14.1 ROM comes with lots of new features like LiveDisplay, Privacy Guard, Protected App, Profiles and lots more. Not only this after flashing the ROM you can also enjoy the Google Assistant and Pixel Launched on your phone with the help of CM14.1 Optimizer. This guide is only for the Oneplus 3 users and don’t follow this method on any other Android phones. Follow the steps correctly otherwise you may brick your device. And make sure that the battery of your device at least 50-60% charged to prevent the accidental shutdown and do take the full backup of your Oneplus 3. 1. First, install the latest TWRP recovery on your phone. If you already done that then go to the step 2. 2. Download the CyanogenMod 14.1 ROM for OnePlus 3 and Gapps zip files from the above mention links. And save both zip files on your phone internal memory. 4. Once you are in TWRP recovery. Take the nandroid backup. 5. Now do a Factory Reset by Go to Wipe > Advanced Wipe > Select Wipe cache, Dalvik cache, System, and data and swipe to confirm it. 6. Now go back to the main menu of your TWRP and select Install and locate the ROM zip file & swipe to Install the ROM file. After the process completes, Flash the GApps zip file. 7. Once both the files are successfully flashed, wipe cache & Dalvik cache again and Reboot your device. That’s It! Now the official CM14.1 Android 7.1 Nougat ROM is installed on your OnePlus 3. If you have any doubt related to above process comment below. Hi, I followed every step on the video but I didnt read what this article said, since I found you on youtube. I installed the rom and everything and it works, but now I cannot access TWRP. I tried reflashing it and flashing the stock recovery and nothing works, can you help me please?